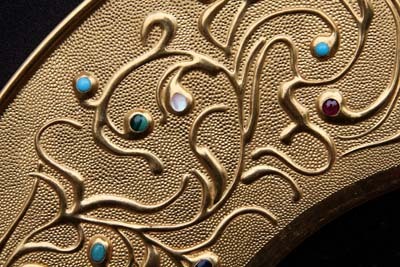 Tooled punchwork and inset cabochon gems sparkle with water gilding. 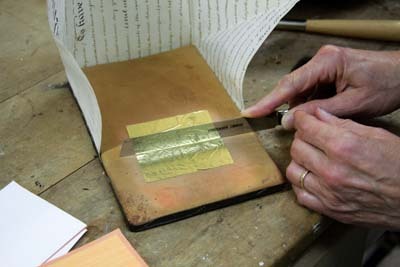 Gilding produces the appearance of solid gold, without the expense or difficulties associated with goldsmithing. The Egyptians applied beaten gold to wooden surfaces to emulate solid gold. The art of applying gold leaf has changed little. Greek and Roman beaten gold was thicker than modern gold but the tools, materials and techniques of ancient craftsmen are virtually the same as those used today. 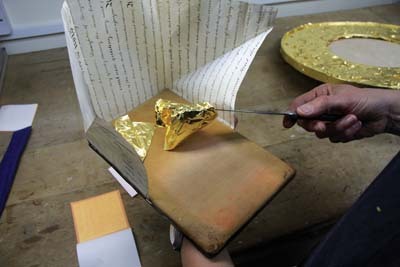 A cast gold ingot is rolled into a strip, then laborious processes of cutting and beating produce gold leaf 1/250,000in thick. Cut into 3 1/4in squares and placed between jeweller's rouged tissues, 25 leaves per book. Gold's ductile nature allows it to be beaten this thin. Other metals don't possess this quality and must be beaten to thicker tolerances. 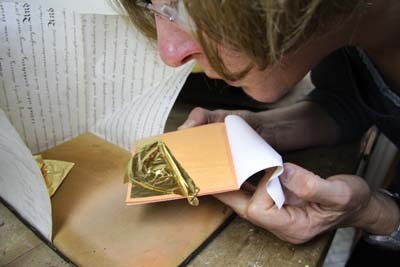 Leaf thickness can affect the colour of the gilding: the thicker the leaf, the deeper the colour appears. The quality of beating and the purity of the gold also affect its colour. Gold's purity is defined by its carat value. Pure gold is 24 carat, measured by comparing the density of gold with an equal volume of water. Gold alloyed with other metals reduces its density, thereby lowering its carat. Gold is inert so it will never tarnish, but alloys in coloured gold do oxidise and will discolour. Gold leaf is available as 'loose' (leaves between rouged tissues), or 'transfer' (leaves on waxed tissues). 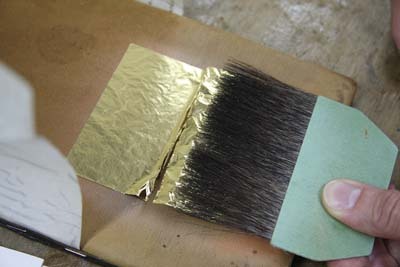 Transfer gold is only used for oil gilding. 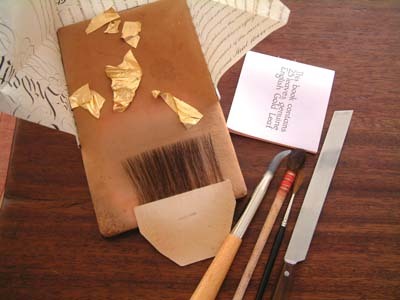 The two basic gilding types, water and oil, have widely different uses, preparations and characteristics. Water gilding is visually more versatile as it burnishes but is the most labour-intensive. It's suitable for interior locations, including picture and mirror frames, wooden sculpture and furniture. Oil gilding is generally reserved for exterior work, seen on signs, inscriptions, stone lettering and interior architectural ornamentation, also on materials including plastics, metal or resins. It cannot be burnished. 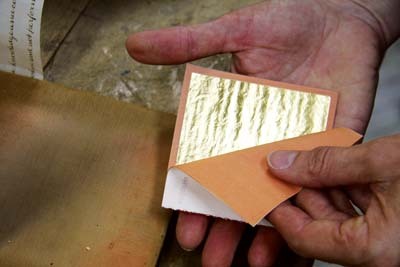 This article deals with water gilding. 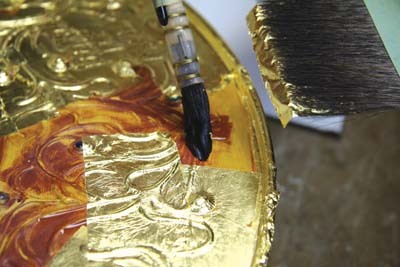 Water gilding's preparation layers allow variations in the texture, brilliance and patination of the gold. Burnishing brings the gold leaf to a shimmering depth of reflection, and matting it contrasts high points with the relief of underlying forms. The quality of the finished gilding depends upon the standard of preparation: gilding betrays any faults in the underlying layers. 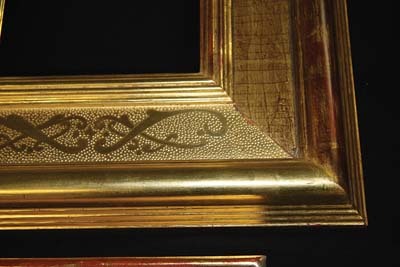 Water gilding requires a wooden support for the preparation layers, which are always applied in the same sequence and with specific drying times. 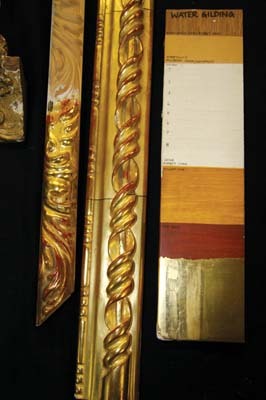 Each process is necessary for the gilding's stability and effect. The wood must be clean, grease-free and with no previous finishes. Make rabbit-skin size glue by adding water to dry glue granules and melt in a bowl resting on chicken wire, in a saucepan full of boiling water. The glue itself must not boil. Rabbit-skin glue is a natural substance, so glue-to-water proportions vary considerably. I use one-part dry glue to ten-parts water. 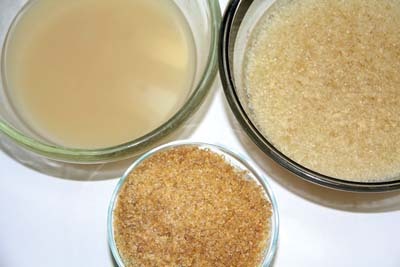 The following day, the dry glue granules will have swollen fully and gel strength can be tested after melting and gelling the glue. When made correctly, it should feel like a stiff table jelly and cut well with a finger. Adjust proportions if required. Melt the glue down again and add a handful of gilder's whiting into the hot glue. Whiting is calcium carbonate - refined, ground chalk. The resulting milky liquid is called 'clair colle', or 'size white'. Apply glue-size generously over the wood, being careful not to allow puddling. Ensure all surfaces are covered. The hot size opens wood-grain, forming a key for subsequent preparation layers. Cover any joints or faults in the wood with small strips of silk applied flat over these wet areas with more glue size. Melt the glue again and remove it from the heat when hot. 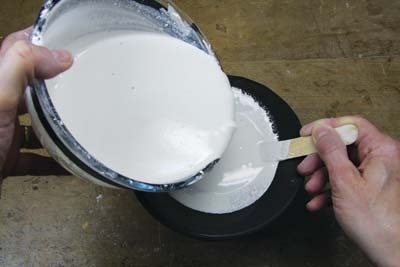 Slowly add gilder's whiting to produce a double cream consistency, stirring gently so as not to introduce bubbles into the gesso. The glue to whiting proportion varies according to the wood type and period e.g. Georgian carved furniture and frames used thin gesso to retain delicately carved detail. Always use the same strength of glue: it's the quantity of added whiting that controls gesso consistency. Test the gesso on a small area on the reverse of the piece. The gesso should almost cover the wood-grain and flow well, but have some body. If it looks thin and watery, add more whiting. 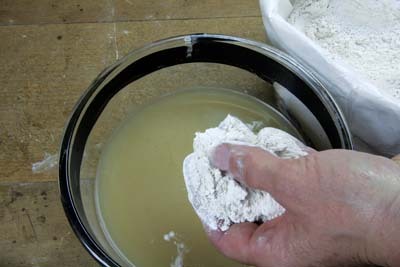 Use caution - excess whiting makes chalky gesso, which crumbles and is unworkable. When satisfactory, strain the gesso through two thicknesses of tights stretched over a bowl. 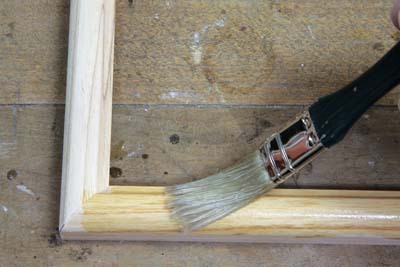 I use large ox-hair brushes to apply gesso although a hog-hair brush is best for initial layers. 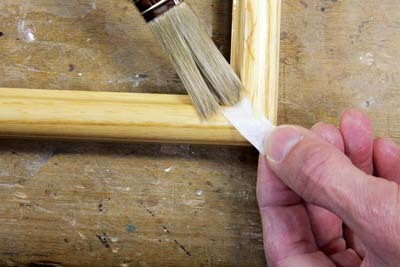 Work the gesso well into the wood and guard against pin-prick bubbles. If bubbles do appear, work briskly over the area until they go. Slowly stir the gesso to prevent skin-formation and resulting contamination. Don't keep gesso over the heat - gesso should be blood temperature or lower. Gently re-heat gesso only when it starts to gel again, on cooling. Hot gesso guarantees bubbles. Eight gesso layers give an average depth - more are needed for cut-gesso work. Apply each layer when the previous one is matt dry. If the gesso is too wet for the next layer, it will look shiny. If it's too dry, it will look opaque and white. Lay each gesso layer down as a thickness, with a flowing movement and some stippling where needed. On intricately carved work or shallow relief, apply about four layers over everything, then add further layers just on the highlights. 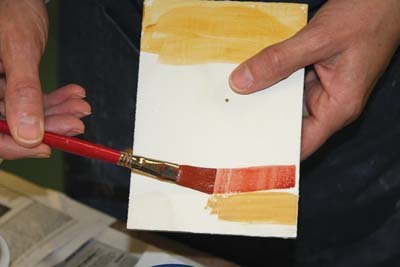 Ideally, apply all gesso layers on the same day, using the same gesso. 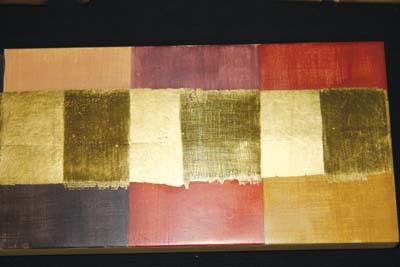 Altering the gesso half way up could cause later flaking, which may only occur after gilding. When dry the following day the gesso may be cut and textured for decorative effect, or to give the gilding a key for any final toning. On carved forms, smooth or shape the gesso using a barely damp, soft cloth, preferably silk. If a crisp form is required, re-cut the gesso with carving tools, 'gesso hooks' or fine abrasive paper followed by damp 'ragging'. 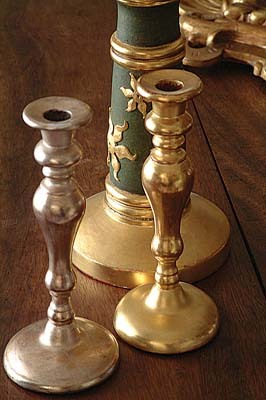 The finish should be smooth and silky, with no blemishes - these will be magnified by the burnished gold. Mix weak rabbit-skin glue with natural clay colours, to make bole. 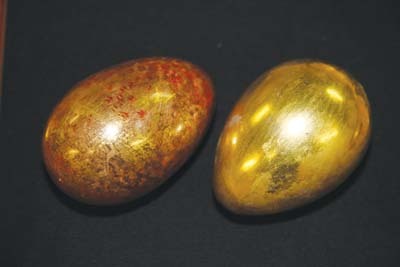 Numerous bole colours exist, sometimes indicating the gilding's original geological location, or a particular period. 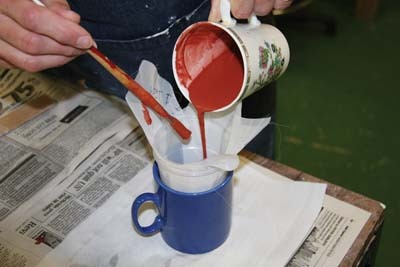 Red is traditionally used on highlighted, burnished areas, whilst yellow is used on flat, matt areas. 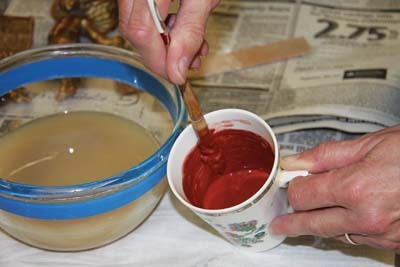 Add a small quantity of melted glue to a walnut of wet paste bole, mixing it with a soft brush. 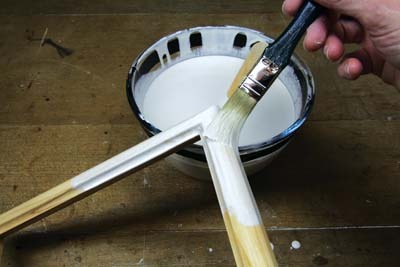 Continue adding glue until a soft brush test covers the gesso without leaving thick brush marks. Adjust glue and bole accordingly. When mixed to a milk-like consistency and satisfactorily tested, sieve it through silk to remove any grit. Apply the bole in smooth, sweeping strokes using an ox-hair brush or similar. Guard against puddling or re-working over wet areas. Let the bole dry thoroughly between layers. 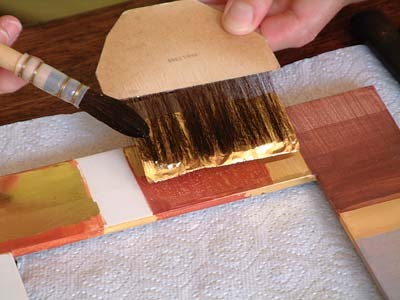 Generally, apply two or three yellow layers over everything and one or two red layers on highlights, which require burnishing after gilding. All bole colours are made in the same way. Polish the bole when it's dry. A stiff, short hog-hair brush held upright and gently scrubbed over the surface gives an eggshell sheen. a cushion or pad, on which the gold is laid and cut, a gilder's knife, a squirrel-hair tip to lift the leaf from the cushion, a mop to wet the bole and agate burnishers. Other non-specialist brushes and tools are also useful. Wet the polished bole with size water. Common proportions are 90% water + 5% rabbit-skin glue + 5% methylated spirits. Traditionally, gin was used for a higher burnish. Now release the loose-leaf gold from the book. Several leaves are dropped into the parchment-shielded back of the cushion and the knife is tapped near the crumpled leaves to create up-draughts and catch the gold on the flat of the knife. The knife is then moved quickly away from the cushion, turned on its return journey and laid swiftly onto the flat cushion surface, the knife being twisted in a rolling action to lay the gold flat on the cushion using air-resistance against the leaf. Practice makes perfect. Position yourself directly above the gold and give a short, sharp puff directly into the centre of the leaf, flattening it into the cushion leather. Cut the leaf into the desired sizes by placing the knife straight down onto the gold. Wiggle the knife once, ensuring it doesn't catch and pull it swiftly back across the whole leaf. Don't lift the knife during cutting, the knife blade should be in contact with the cushion the whole length of the leaf. Pick up the gold leaf by brushing the 'tip' onto your neck, hair or wrist, to transfer a little grease onto the tip hairs. Position the tip directly over the gold and with a steady action press the tip onto the leaf and lift it upwards. The action is one fluid movement - hesitation results in loss of control. Wet the bole with the size water using a squirrel-hair mop. The bole should be shiny when the gold is laid - if it's matt the gold may not stick. Moving without hesitation, float the gold down onto the wetted area, pressing the tip gently onto the surface as the size water draws the gold down. Lift the tip away vertically when the gold has dropped onto the bole. Press the leaf down gently, either with a long haired sable writer's brush, or with cotton wool, being careful not to tear the leaf. Gild from the high points downwards, so any free size water won't stain adjacent gold. Use a small brush for inaccessible areas, rather than a tip. 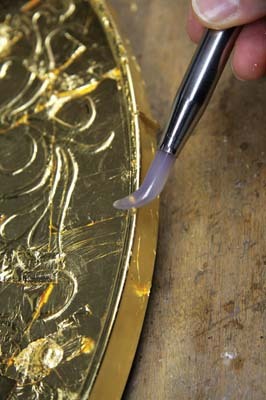 Slightly overlap the gold leaves during gilding, to prevent gaps ('faults') or staining. Test for burnishing when the gold is sufficiently dry. Drying times vary according to the ambient conditions and the porosity of the gesso and bole, but expect to burnish soon after gilding. Test readiness by gently tapping the surface with the burnisher - if it sounds hollow, it's ready - if a dull thud results, it's too wet. Experience will tell you the optimum burnishing time - this may be anything from five minutes to several hours or even a day. Rub the agate stone burnisher gently over the surface, applying even and gentle pressure. The burnish should come almost immediately. If the burnisher pushes into wet gesso and bole, leave longer to dry. If the gold doesn't burnish and the burnisher sounds scratchy, the surface is too dry and will never burnish successfully. Catch the right burnishing point and the gold will reward you readily. Burnish only the high points, leave remaining areas with the matt finish of raw gilding, enhancing the depths and relief of the carving. New gilding can look rather bright. Distressing and toning softens the effect. Distressing artificially wears the gilding away, as would happen naturally over the centuries. 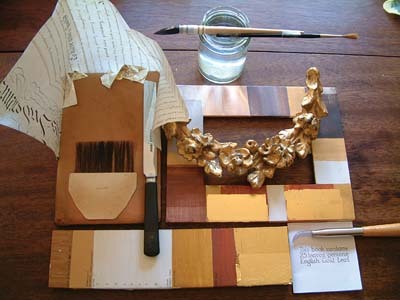 Toning involves applying various thin glazes and colouring layers, to enhance and protect the gold. 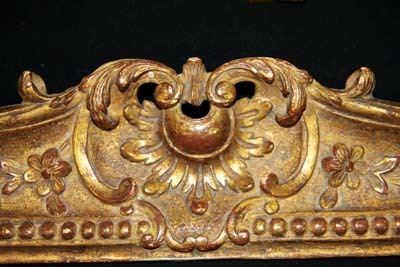 Distressing was never an original gilding process, but it now forms part of the acquired patina of period gilding. Different types of toning were fashionable throughout the ages. If distressing new gilding, use mild abrasives such as French chalk, rottenstone and pumice powder mixtures on a soft cloth. Toning materials include watercolours, oil paints and glazes, shellac, waxes and rabbit-skin glue amongst other materials, applied in delicate, thin layers, until the desired result is achieved. Modern lighting flattens the shimmering, magical quality of water-gilding, which in original, flickering candle-light must have been truly awe inspiring. many Museums including the V&A, Brighton Pavilion, The Burrell Collection and the Wallace Collection.